Massive Attack, hailed as the progenitors of Trip Hop, are a collaborative music production duo from Bristol, UK. Working with co-producers, as well as various session musicians and guest vocalists, they make records and tour live. DJs Grantley "Grant" Evan Marshall, Andrew "Andy" Lee Isaac Vowles and graffiti artist-turned-MC Robert Del Naja met as members of DJ/MC partying collective, The Wild Bunch. One of the first homegrown soundsystems in the UK, The Wild Bunch became dominant on the Bristol club scene in the mid-1980s. Massive Attack were originally a side project started in 1988 with the release of their first single "Any Love”. The work earned them a record deal with Circa Recordsin 1990 committing them to deliver six studio albums and a "best of" compilation. Massive Attack are best characterised by trip hop and experimental however they have as diverse a collection of influences as any band out there. They’ve often expressed their motivation to avoid the obvious and take a different creative approach to each album. Some of their most noted songs have been without choruses and have featured dramatically atmospheric dynamics, conveyed through either epic distorted guitar crescendos, lavish orchestral arrangements or prominent, looped/shifting basslines, underpinned by high and exacting production values, involving sometimes copious digital editing and mixing. The tempo of their music has often been slower than prevalent British dance music at the time and this and other psychedelic, soundtrack-like and DJist sonic techniques, formed a much-emulated style journalists began to dub "trip hop" from the mid-nineties onwards. Their debut album, Blue Lines was released in 1991 and was co-produced by Jonny Dollar and Cameron McVey, of who also became their first manager. With Protection in 1994, Mezzanine in 1998, and then Robert Del Naja's essentially solo 100th Window in 2003, Massive's overall sound grew persistently more experimental and melancholy, having a greater degree of gothic post-punk texture and moodily cinematic electronica integrated into it. 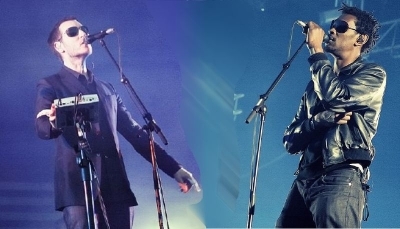 Differences in the band have been ripe over the last decade and have prevented the band from producing their best, however their latest release Heligoland represents a step in the right direction and with ten’s of million of albums sold worldwide, Massive Attack continue to command a host of loyal fans all over the world.